The Arcadia Theater will be closed on Monday, October 8, 2018, in celebration of Columbus Day. We will re-open on Tuesday, October 9, 2018, at 10 am. For decades and decades, American history books and school teaching told us Christopher Columbus discovered America. What those books and teachings did not give credit, to was the fact that Native Americans were already here. Native Americans truly discovered America. It also gave little mention, to the fact that Nordic explorers had traveled down the eastern coast of Canada hundreds of years before Columbus arrived. Today, we celebrate Columbus Day for what it accurately is. Columbus did discover the existence of the New World for Europeans who until then, believed the world was flat and ended somewhere in the Atlantic. And, the focus is now more about the discovery of the “New World”, and less upon Columbus himself. Did You Know? 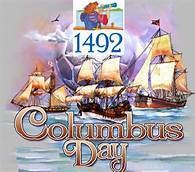 Columbus Day is increasingly referred to as “Discoverer’s Day”. Columbus Discovered America in 1492. He originally set sail on August 3, 1492, but had trouble with the ships, stopping at the Canary Islands for a month. The ships left the Canary Islands on September 3, 1492. While Columbus was an Italian, he could not procure funding in Italy, so he turned to the King of Spain. King Ferdinand and Queen Isabella provided the funding. Christopher Columbus did not land on the U.S. mainland. He landed on an island in the Caribbean. While many believe he landed on San Salvador, there is still debate on which island he originally landed on. http://arcadiawindber.com/wp-content/uploads/2018/10/Columbus-Day-Clip-Art.jpg 172 195 Windber Arcadia Windber Arcadia2018-10-05 14:35:442018-10-05 14:35:44Honoring Columbus Day! Here is what we have remaining……. Hot Seats Became Available for Hotel California!